Constructed in the Sui dynasty and Renovated in the Five Dynasties, this cave consists of a main chamber, a corridor and a front chamber. The main chamber has a gabled ceiling in the front and a central pillar connecting the ground with the flat ceiling in the back. On the two slopes of the gabled ceiling are jataka tales painted in two horizontal bands, and on the flat ceiling are pictures of the Sui dynasty preaching scenes and painted laternendecke motifs. The central pillar is shaped like Mt. Sumeru formed by a seven-stepped inverted pagoda on the upper and a two-stepped square base on the ground. There is a arch niche in each side of the central pillar. The east one contains the statues of a Buddha and two disciples (the one on the north side is lost) and two bodhisattva statues flanking the entrance (the one on the north side is preserved, though damaged partly). The niche has a painted lintel in bas-relief with a dragon-headed beam and pillars decorated with lotus motifs. The niche in the south side contains a statue of the Buddha and two bodhisattvas (renovated in the Qing dynasty). On each side out of the niche is a statue of bodhisattva (the one on the west side is lost). The niche in the west side contains a central Buddha flanked by two disciples renovated in the Qing dynasty. The niche in the north side also contains a three-figure group renovated in the Qing dynasty, and the two statues out of the niche are lost. Beneath the paintings on the north side of the central pillar below the niche can be seen some words "June 11 in the fourth year of Kaihuang era," which indicates when this cave was constructed (around 584 CE), hence the name "Cave of the fourth year of Kaihuang era." This inscription with exact date is not only a reliable evidence for dating the Sui dynasty caves, but also a criterion for studying the artistic styles of the caves of that period. A large niche with a double recesses dug out of the west wall contains a five-figure group: a central Buddha, two disciples, and two bodhisattvas (without head). Flanked the nimbus on the inner niche wall are two images of incarnated boys. The lower part out of the niche are eight bhiksunis of the Song dynasty, beneath which are traces of the Sui dynasty paintings. On the ceiling of the niche are images of ten heavenly musicians. The upper part of the south wall depicts twelve heavenly musicians, railings and draperies from west to east, and the middle part is covered with the thousand Buddha motifs, amid which is a preaching scene of the Medicine Buddha, and a double-recessed niche housing a central Buddha and two disciples (only the disciple on the west side is preserved) and two bodhisattvas on outer niche (only the one on the east is preserved). The niche lintel is decorated with honeysuckle motifs. On the back part is a preaching scene. On the junction of the south wall and the ground are nine bhiksus and male donors of the Song dynasty, beneath are traces of the Sui dynasty paintings. 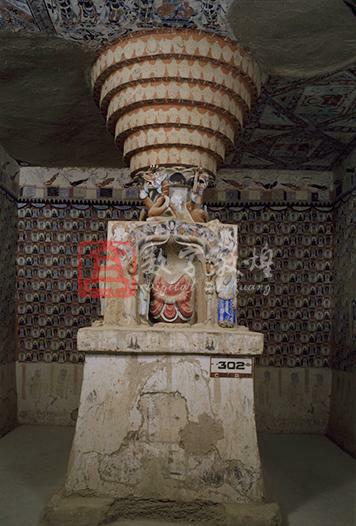 On the upper part of the north wall is a preaching scene of Sakyamuni and Prabhutaratna which was damaged by a hole dug through the wall; on the part connecting the ground are a row of the Song dynasty donor figures, beneath are traces of the Sui dynasty paintings. The top of the east wall are occupied by heavenly musicians, railings and draperties, and on the space above the entrance is a preaching scene flanked by the thousand Buddha motifs in addition to bhiksus and donors. On the tent-like ceiling of the corridor is a scene of the thousand-armed and thousand-eyed Avalokitesvara of the Song dynasty, and on each of the side walls are four dhyana Buddhas of the Song dynasty. Most of the ceiling in the front chamber has collapsed. On each side of the entrance in the west wall is a scene of Vaishravana attending Nezha's assembly dating back to the Song dynasty. On the upper part of the entrance are respectively an illustration of the Cintamani-cakra and of the Amogha-pasa, and the middle parts are filled with scenes of four dragons paying respect to the Buddha. 。 The top of the east wall are occupied by heavenly musicians, railings and draperies, and on the space above the entrance is a preaching scene flanked by the thousand Buddha motifs. On the south side are images of a bhiksu and seven female donors (obscured), and on the north are two bhiksus and six female donors (obscured). The upper part of the south wall depicts twelve heavenly musicians, railings and draperies from west to east, and the middle part is covered with the thousand Buddha motifs, amid which is a preaching scene of the Medicine Buddha and a double-recessed niche housing a central Buddha and two disciples (only the disciple on the west side is preserved) and two bodhisattvas on outer niche (only the one on the east is preserved). The niche lintel is decorated with honeysuckle motifs. On the west side is a preaching scene. The bottom paintings contain nine bhiksus and male donors of the Song dynasty, beneath which are traces of the Sui dynasty paintings. There is an inscription attached to the first donor which reads: "Donated by Buddhist disciple Zhang Chao." On the top part are ten heavenly musicians, railings and draperies, and on the middle part are the thousand Buddha motifs, in the center of which is a double-recessed niche housing a central Buddha with two disciples. And there are two bodhisattvas on the outer side of the niche, neither having the head remaining. The nimbus on inner wall is flanked by two incarnated children. The bottom part contains images of eight bhiksunis of the Song dynasty, beneath which are traces of the Sui dynasty paintings. On the upper part of the north wall is a preaching scene of Sakyamuni and Prabhutaratna which was damaged by a hole dug through the wall. On the part connecting the ground are a row of the Song dynasty donor figures, beneath which are traces of the Sui dynasty paintings. The back part of the north wall contains a niche amid the thousand Buddha motifs which contains two bodhisattvas (neither has the head remained), and there is a preaching scene on the west side. Beneath the surface paintings of the Song dynasty donor figures are traces of the Sui dynasty paintings. The niche in the east side of the central pilalr contains the statues of a Buddha and two disciples (the one on the north side is lost) and two bodhisattva statues flanking the entrance (the one on the north side is preserved, though damaged partly). The niche has a painted lintel in bas-relief with a dragon-headed beam and pillars decorated with lotus motifs. A bodhisattva is painted on each side out of the niche. The edge of the base is decorated with Song dynasty thousand Buddha motifs, and below it are three bhikhus of the Song dynasty. Beneath these paintings are a row of Sui dynasty donors and an votive text in which the words has been unidentified. The niche in the south side contains three statues: a central Buddha and two bodhisattvas (renovated in the Qing dynasty), and two bodhisattva on outer sides (only one left). The lintel is made in bas-relief decorated with flames and the beam decorated with honeysuckle motifs. A bodhisattva is painted on either side out of the niche. Along the edge of the base are ponds with lotuses, and on the base are two heavenly musicians painted in the Song dynasty, beneath which are a row of donor figures and an inscription. The niche in the west side contains statues of a central Buddha, and two disciple (renovated in the Qing dynasty). The inner wall depicts two incarnated children on lotuses. On each side out of the niche is a bodhisattva statue (the one on the north side is preserved). The moled lintels and beams are decorated with honeysuckle motifs, and the pillars are wrapped with the silk. A bodhisattva image is painted on both sides out of the niche. Along the niche edge is a pond with lotuses, and below are the Song dynasty paintings, already obscured. Beneath the top layer is a row of the Sui dynasty donor figures together with an inscription which indicates that most of the donors were bhiksus. The niche on the north side contains a three-figure group renovated in the Qing dynasty, and two incarnated children on inner wall. The statues on the two sides out of the niche have been lost. Both the molded beam and lintel of the niche are decorated with honeysuckle motifs and the pillars with lotuses. On each side out of the niche is a painted image of a bodhisattva. Along the bottom edge of the niche is a pond with lotuses, and beneath on the base of the central pillar are three female donor figures of the Song dynasty. Beneath this is a row of donor figures together with an inscription, both dating back to the Sui dynasty. On the north side, the painting beneath the top layer contains a few words " "June 11 in the fourth year of Kaihuang era," which indicates when this cave was constructed (around 584 CE), hence the name "Cave of the fourth year of Kaihuang era." This inscription with exact date is not only a reliable evidence for dating the Sui dynasty caves, but also a criteria for studying the artistic styles of the caves of that period. On the ceiling are a scene of the thousand-armed and thousand-eyed Avalokitesvara of the Song dynasty.